Britain's biggest rock festival, Glastonbury Festival, has slated a major R&B/pop star to take the stage on its closing night: Beyoncé. Announced on February 10, she will follow in the footsteps of rapper husband Jay-Z, who stirred up a whirlwind of controversy with his headlining set back in 2008. Nominated for two Grammy Awards this year, the star is working on her fourth album and plans to perform a 90-minute set on the last day of the festival. Rumors were circulating earlier this week about her headlining the event alongside U2 and Coldplay, although no performers have yet to be confirmed by Glastonbury organizers. In a statement, Beyoncé says she is "pumped just thinking about that huge audience and soaking up their energy." She adds: "This really is the biggest festival in the world and I cannot wait to perform there." In 2008, Beyoncé attended Glastonbury to watch Jay-Z headline the event. Despite controversy about his headlining, he "thrilled the crowd with a storming show following huge criticism," according to music news website Contact Music (www.contactmusic.com). The announcement "serves as another career milestone in Beyoncé's undeniable quest for iconic status," writes music website That Grape Juice (thatgrapejuice.net). "For, besides husband Jay-Z, very few non-rock acts have been granted the privilege of headlining" the event. Beyoncé has won 13 Grammy Awards as a solo artist and three as a member of her former girl group Destiny's Child. She has sold a reported 75 million records worldwide, making her one of the best-selling musicians of all time. 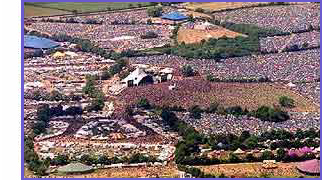 The Glastonbury Festival, June 23-28 in Pilton, England, is one of the biggest and best-loved music festivals in the world, known for its all-star lineups as well as for its varied arts offerings. The 2010 event featured Muse, Stevie Wonder, Shakira, Snoop Dogg, and Gorillaz. Tickets for the 2011 festival are sold out, but check with the website for a possible resale of canceled tickets. A standard ticket is £185 (€218), which includes camping; additional prices include £15 (€18) for car parking, £75 (€88) to bring a camper van, and £820 (€967) for tipi rental. Also reported to headline Glastonbury, Coldplay is performing at the Rock Werchter Festival in Werchter, Belgium, which runs June 30 to July 3.